MSMC administration sent an email Sept. 21 announcing that there would be an investigation into the mold in Sakac, the home of the Mount’s freshman girls. This investigation led to the complete closure of Sakac Hall for an undetermined amount of time, leaving over 200 students forced to relocate after only just beginning their college lives barely three weeks prior. The residents were originally moved to either the Garden Apartments or Guzman Hall on campus or to nearby hotels in Fishkill and Newburgh. Buses were used to provide transportation to and from campus for the students in the hotels. 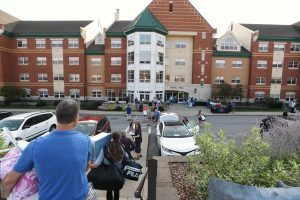 The hotels could not accommodate the Sakac residents past one week, leading to girls either being sent home or relocated to extra spaces on campus as of Sept. 28. Those relocated on campus were moved to the following places: lounges throughout the Dominican Center, empty rooms in Guzman Hall made by condensing residents, study rooms in the Kaplan Library and empty rooms in the College Courts made by condensing residents and moving out faculty. The Sakac residents who were sent home this week were allowed to either commute to campus or work from home. On Oct. 7 they will be coming back to campus and being moved into temporary housing on campus in houses previously used as offices on Powell Avenue as well as into any space available in the dorms across campus. The Residence Life office has been working around the clock to try to make everything as easy a process as it can be. Kaplan Family Library has offered free use of lockers outside the DC Café to Sakac residents and set up “Comfort Stations” with refreshments around the library. The date of completion on the cleaning of Sakac is still currently undetermined, with predictions across campus ranging from a few weeks to the end of the semester.